RX Made is on a mission to turn materials from the waste stream into well-made, well-designed products for everyone. The startup has collaborated with Strand Design to develop a line of sustainably sourced and locally manufactured products – including a “Beerclaw” bottle opener made from reclaimed floor boards, a “Timepiece” wall clock made from small wood shop scraps, and a modular “Stackit” storage system made from reclaimed dimensional lumber. Check out all of their products here and donate to their Kickstarter to help launch this great line of green furniture! 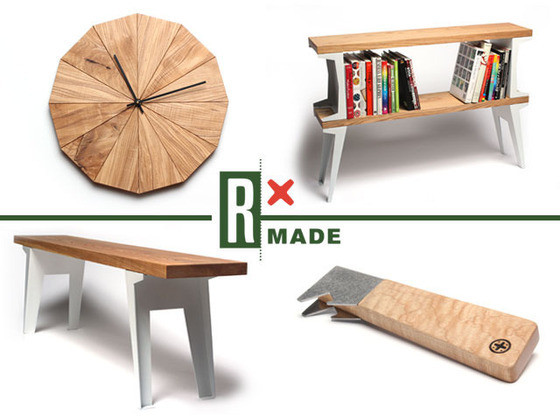 I really liked the furniture RX made​​, it is important that the world is moving in this direction! I wanted to report a small business eco-friendly furniture that I have discovered: http://www.woodly.it/ I liked it because, not only the products are beautiful and environmentally friendly, but also the concept of the company is very attractive. RX Made is on a mission to turn materials from the waste stream into well-made, well-designed products for everyone. The startup has collaborated with Strand Design to develop a line of sustainably sourced and locally manufactured products - including a "Beerclaw" bottle opener made from reclaimed floor boards, a "Timepiece" wall clock made from small wood shop scraps, and a modular "Stackit" storage system made from reclaimed dimensional lumber. Check out all of their products here and donate to their Kickstarter to help launch this great line of green furniture!